← Allison models for us again! My roommate, Destiny, and I arrived at the social at the Ramada Inn just past ten. After some fun photos (see below) and networking, we moved on to the dance party at the Raven. I’m so glad I brought my camera to the party the first night because the place was too packed the second night to get many good shots. The Raven has a really cool layout with disco balls lighting up the dance floor (see photo below), music blaring, and music videos on flat panel TVs. 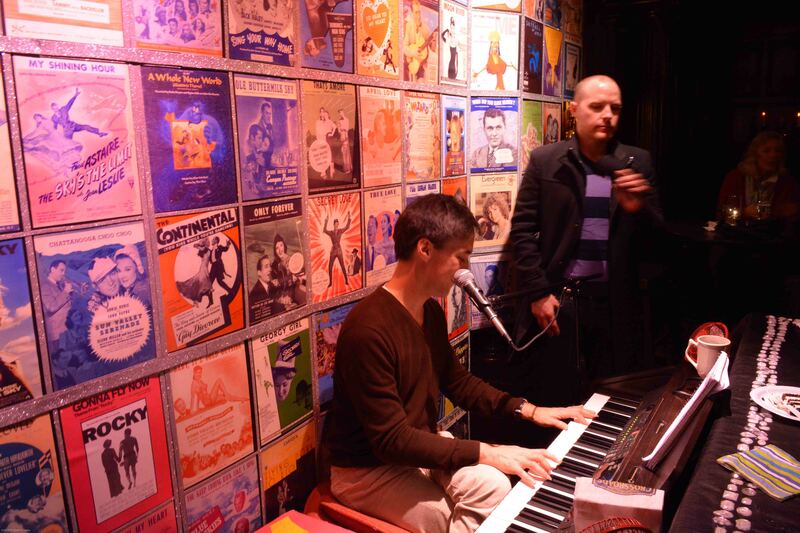 For a more relaxed vibe, the piano bar in the back (see photo below) attracts the regulars with its upbeat music, glitter-framed album covers, glitter decorated piano, and full-service bar along with plenty of seats and standing room. 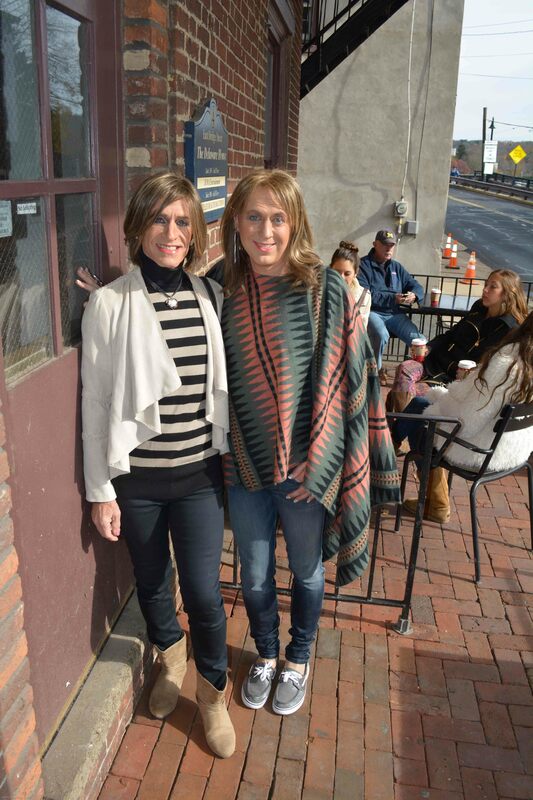 The next day, Destiny and I met several tgirls at Starbucks in the town of New Hope (see photos below). We did some window shopping and stopped for an early afternoon beer before heading back to the New Hope Lodge for some rest before the red carpet photo shoot, dinner, and dancing. Destiny kept saying that we needed to pace ourselves. She was right! While I missed the red carpet shoot and dinner, it was for an absolutely fabulous reason–makeovers!!! I did makeup makeovers for two tgirls, Antoinette and Ema (see pics below), who were headed to the Raven party. 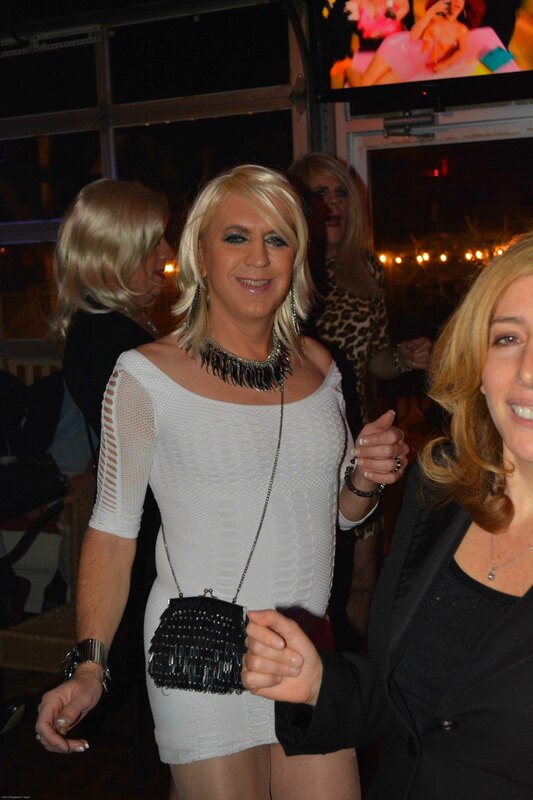 Unlike my typical closeted crossdresser client in DC, both of these girls wanted a self-described “slutty” look with both dramatic eyes and dramatic lips. As the transformation fairy (a reference to my Halloween costume), their wish was my command and I gave them dramatic, colorful eyes and intense lips. They both loved their looks and agreed to let me post their makeover photos here! After makeovers, I transformed myself into a little black dress and added drama to my daytime makeup with green tea and in the navy eye crayons along with more mascara. I got a few photos of Destiny dancing (see below) but after that I stowed my camera for safe-keeping. I met some really cool people including tgirls, crossdressers, straight males, admirers, and genetic girls into crossdressers. Wow! So much fun and so much diversity of expression! I loved it! I definitely plan to go back to Raven and hope to get two days of makeovers in for clients next time! 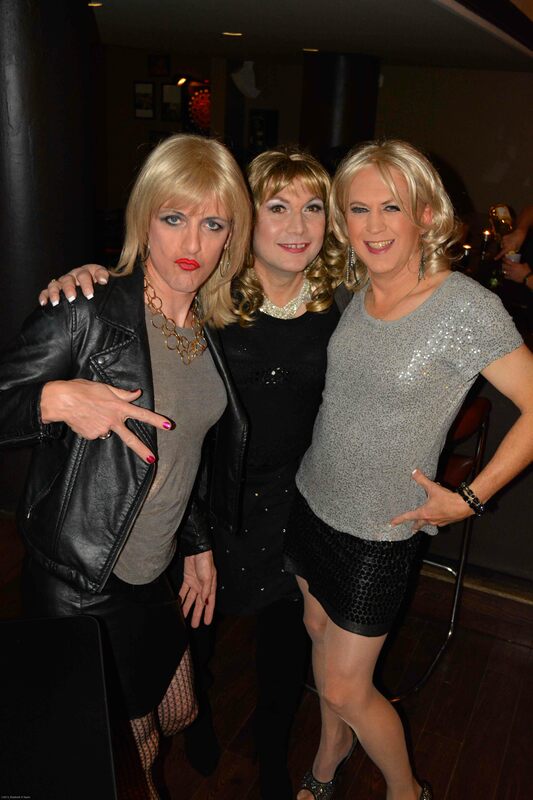 Organizer Jen Bryant, Destiny, and another tgirl have fun reuniting at the opening mixer of Raven 17. Raven’s piano bar draws the regular patrons and tgirls alike. Check out the glitter-framed album covers on the wall and the glitter on the piano. I love glitter! The disco ball lights up the dance floor on Friday night. The dance floor was far too crowded Saturday night to get any shots like this. Destiny and DC’s 2013 Queer Prom Queen, Linda Roberts, enjoy some sun outside Starbucks before we started our window shopping in the town of New Hope, PA.
Destiny and I joined up with a group of tgirls for our window shopping. Check out our group shot with the beautiful fall foliage! Antoinette shows off her dramatic makeup makeover look while she’s still wearing pink passion lipstick. That pink lipstick got updated to mulberry forest glossy lip stain in the next photo after she expressed that this look was not “slutty” or dramatic enough for her. Ema loves her dramatic blue eye makeup. She also selected a darker lipstick in keeping with her desire for a “slutty” look. Ema shows off her figure and outfit after her makeup makeover with me. Check out the fun shoes with the ankle cuffs! You’ve got to love Destiny, my hot roommate with a great sense of humor. While I didn’t do her makeup, I love Destiny’s looks and how she carries herself with confidence. 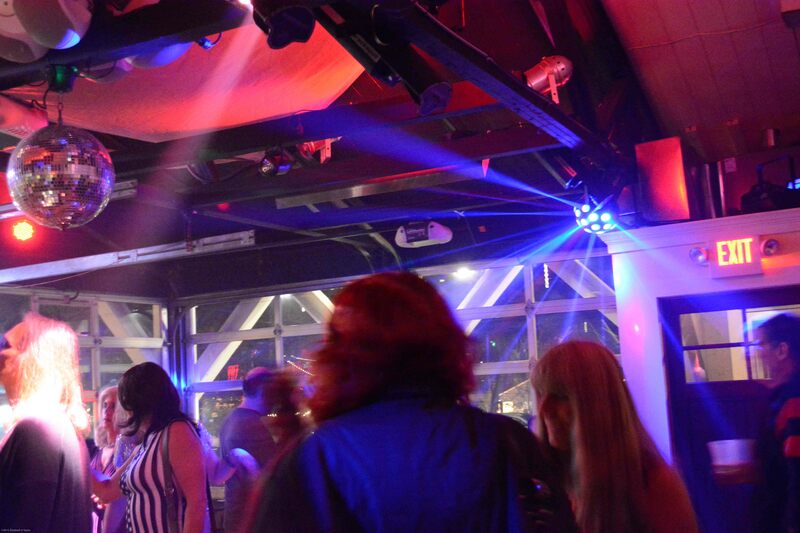 Destiny loves dancing at Raven 17 on the Saturday night when the dance floor is packed! I meanwhile hung out at the piano bar and main bar areas and got to meet lots of new tgirls, genetic girls, male admirers, straight males, lesbians, and gay males. Wow! Now that’s a rainbow of diversity! Love it! to ElizabethTaylor. I’ll have to get on line soon for one.i’ll have to try to get to my first raven. It sounds like an evening at Raven would be a LOT of fun.